By analyzing certain SNP mutations that developed in men long ago and were then passed to their descendants today, we can begin to build a family tree, of sorts, of theoretical ancestors in which these mutations were developed. R-Z16357 (a code name used to identify distinct a mutation) is one branch on the larger SNP tree of humanity that begins with 'Adam'. Unlike traditional genealogy which works backward from present day to our ancestors, the SNP tree starts with very ancient man and moves closer to the present day as new mutations are identified via DNA testing of distantly related cousins. Alex Williamson maintains The Big Tree - a wonderful tool for haplotree visualization and SNP analysis. View R-Z16357 on The Big Tree. Note that only people who have completed Big-Y or FGC testing are shown on this tree. Click the chart above to view in PDF format. This chart shows the major, confirmed SNP haplogroups for and downstream of R-Z16357. Additional branches will be added as they are confirmed. The surnames in the light green box are some of those that may be added via additional SNP or Big-Y testing. This chart presents all known SNPs shared among people on our portion of the tree. The names of each man (with FTDNA kit #s in parentheses) that have each SNP (but not an SNP lower on the tree) are shown. This site and these charts are administered by Jared Smith (kit #307773). "Z16357 - 22512912-G-T", for example, indicates the SNP name (Z16357) and the DNA position and mutation type for that SNP (position 22512912 has a G to T mutation). The number of different SNPs/mutations in each haplogroup box gives an indication of how many generations of ancestors passed on that mutation without another known family line branching off. The large Z16343 haplogroup represents around 1500 years where our ancestors were likely isolated with few living descendants. The lower boxes on the chart are closer to present day - representing ancestors that lived less than 1000 years ago. As additional testers, SNPs, and branches are added to the tree, we gain better insight into timelines and locations (most likely in and from the British Isles) for these ancestors. The yellow boxes indicated confirmed (current) terminal SNPs. The pink boxes indicate potential new branches that have available SNP tests. All that is needed to form a new branch at these spots is an additional distantly related tester who is positive for the relevant SNP. 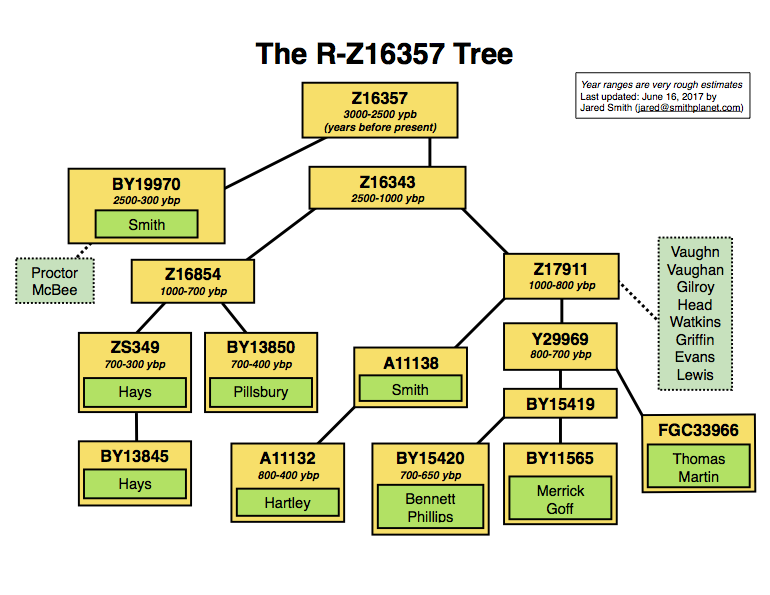 The following shows how R-Z16357 fits into the overall haplotree of humanity.